Telephone conversation initiated by the Indian prime minister marks New Delhi's first high level contact with the Pakistani prime minister-elect. New Delhi: Prime Minister Narendra Modi called up Pakistan’s prime minister-in-waiting Imran Khan to congratulate him on his Pakistan Tehreek-e-Insaf (PTI) emerging as largest political party in the recent election. The Ministry of External Affairs press note said that Modi spoke about his vision for peace and development in South Asia, while the read-out from the Pakistani political party claimed that Indian prime minister suggested evolution of a “joint strategy” for progress in their bilateral affairs. The MEA released a statement on Monday night noting that Modi had called Khan earlier in the evening to convey a personal congratulatory message. “Prime Minister spoke to Mr Imran Khan, chairperson of Pakistan Tehreek-e-Insaf Party and congratulated him for his party emerging as the largest political party in the National Assembly of Pakistan in the recently conducted general elections,” said the MEA communique. PTI has emerged the winner of parliamentary elections with 116 seats, with the previous ruling party Pakistan Muslim League (Nawaz) obtaining just 64 seats. Khan’s party is currently involved in negotiations to cobble together a coalition by talking to smaller parties. The MEA press release noted that Modi “expressed hope that democracy will take deeper roots in Pakistan”. The “prime minister also reiterated his vision of peace and development in the entire neighbourhood,” it added. In Islamabad, Imran Khan’s party released a a set of highlights of the conversation which quoted Modi as talking about a “new era” and “joint strategy in bilateral relations. “Pakistan ke saath taaluqaat mein naye daur ka aaghaaz par taiyaar hain – Bharatiya vazeer e azam (We are ready for the beginning of a new era in relations with Pakistan – Indian prime minister),” said the PTI press note. It further stated that Modi had advocated a more active approach. “Muamlaat aagey badhaaney ke liye donon mumalik ko mushtarka hikmat-amli apnana hoga – Bharatiya vazeer-e-azam (Both countries should adopt a joint strategy for progress in bilateral affairs – Indian prime minister)”. 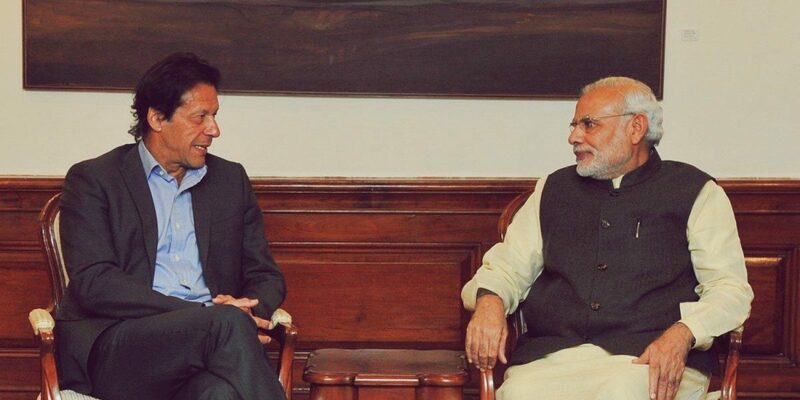 During this conversation, Imran Khan told Modi that solutions to disputes should be found through dialogue, as per the PTI press release, which made no mention of the ‘Kashmir’. He further stated that the two governments should devise a joint plan of action on poverty alleviation. “Instead of answers to conflicts, wars and bloodbath give birth to tragedies,” Khan told Modi, as per the press release. Khan’s remarks mirrored those that he made in his victory speech on July 25. Along with Modi’s purported call for a “joint strategy”, there was no direct mention in the MEA press statement about Imran Khan’s offer in his election victory speech to hold talks with India and stop the “blame game” on Kashmir. “The leadership of Pakistan and India now need to come to the table to resolve this and end the blame games,” he said on July 25, adding “we are stuck now in square one”. Modi’s phone call was his first direct contact with Imran after they had met in New Delhi in December 2015. At that time, both leaders had hoped for “closer cooperative ties between the two countries”. India’s first response to the elections came on Saturday when it had welcomed the fact that the “people of Pakistan have reposed their faith in democracy through general elections”. “India desires a prosperous and progressive Pakistan at peace with its neighbours. We hope that the new Government of Pakistan will work constructively to build a safe, stable, secure and developed South Asia free of terror and violence,” said the MEA spokesperson. Modi’s call to the victor came two days after the results were formally announced, in contrast to the congratulatory message Manmohan Singh had delivered to Nawaz Sharif when the latter won the 2013 elections.